Summer vacation is almost over, though the summer heat is hanging around for Labor Day weekend. We like to kick back and relax on this holiday weekend the last before the hectic school year begins and I’m back to working while managing Mom’s Taxi schedule. A mother’s job never ends. Though Labor Day weekend is often advertised as the “last grilling weekend,” it’s hardly that for us. We grill all the way until snow starts coming down. This grilled pork chops recipe I found in the August issue of Cooking Light is perfect for a grill meal, and it’s comes together quickly. I rubbed the chops down with lime juice, oil, and jerk seasoning mixture and let them rest on the counter while I did the rest of the vegetable and fruit prep. The grilled mangos are so simple, and the peel holds the mango together on the grill, so one less job for the cook. After I grilled the pork chops, which smelled fantastic, I threw some thick red onion slices on the grill with the mangos, and served it all with a fresh cabbage salad. The rum sauce was a bit strong for the boys, so they ate their chops with a squeeze of lime juice while Michael and I slurped up the sauce. My guys devoured everything, so this is a meal we will make again and again. Happy Labor Day to everyone, and may you have a relaxing and enjoyable weekend! 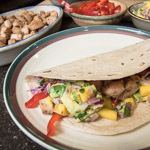 Jerk seasoning is a traditional spice mix from Jamaica, and you can find it in most well-stocked grocery stores, but you can also make your own with the ingredients below (from Coastal Living magazine). If you have a pantry full of spices, you’ll be able to whip it up in a snap. The mango is grilled with the skin still on, and The Mango Board has easy directions for cutting fresh mango. The recipe calls for a grill pan, but you can also do this on an outdoor grill. If your grill has a side burner, you can make the sauce right there while the meat and mangos cook. Adapted from Cooking Light and Coastal Living. 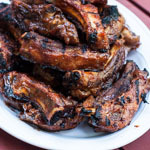 Combine jerk seasoning, 1 tablespoon lime juice, and 1 teaspoon sunflower oil in a medium bowl. Rub all over the pork chops and allow to rest about 20 minutes. Cut the mangoes vertically, so you will have two even pieces, leaving the pit. Cut each mango piece into 1-inch cubes, cutting to, but not through, the skin. Brush cut sides of mangoes with the remaining 1/2 teaspoon oil. Heat a grill pan over high heat, and rub lightly with sunflower oil. Cook the pork for 4 minutes on each side. Cook the mangoes, skin sides up, for about 3 minutes. Remove from heat. Combine brown sugar, rum, butter, and salt in a small saucepan. Bring to a boil, then reduce heat and simmer until thickened, about 4 minutes. Stir in 1 tablespoon lime juice. 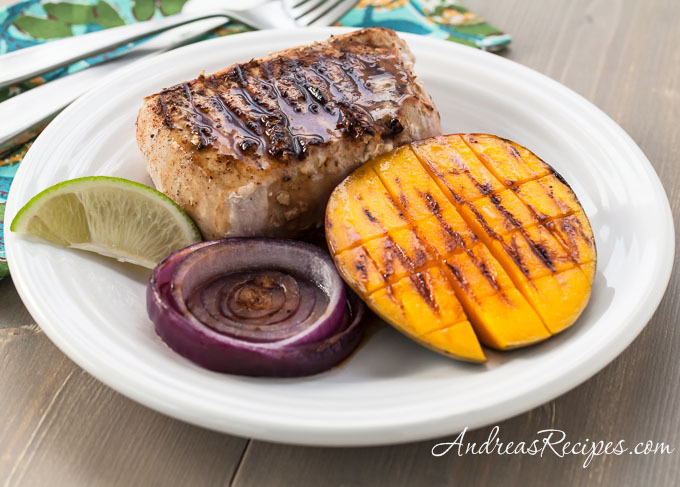 Drizzle the sauce over the pork chops and mangoes and serve. I need to make this for my Jamaican-raised mum the next time she visits. We would all love that rum sauce! 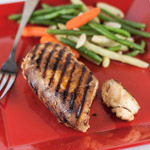 Thanks for including my salmon in foil recipe! Thanks Dara! Your salmon recipe looks and sounds so good!